Meaning of Balaji – Lord Vishnu – How Venkateswara Came to be Known as Balaji? 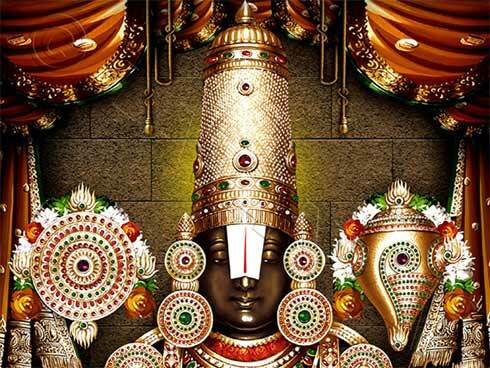 The Balaji form of Lord Vishnu is most famously associated with Lord Venkateswara who is worshipped in the famous Tirupati Balaji Temple in Tirumala. As per Bhagavad Purana the name Balaji means ‘the cosmic child’ or ‘eternal child.’ This meaning has nothing to do with the present day meaning of the term. So how did Venkateswara came to be known as Balaji. When man breaks Dharma, he breaks cosmic order. Nature is in disarray. The cosmic dissolution happens to set the house in order. Destructive storm and torrential rains destroy all manmade things in the universe. The raging waters consume all that is there in the world. Then on the endless ocean, a banyan leaf floats and on it, we get the first glimpse Balaji – a dark child, suckling his right toe. He is the cosmic child. Next cycle of creation begins with his appearance. (This form of Vishnu is also referred as Vatapatrashayin). But before the next cycle of creation, there is a great slumber. All manmade things dissolve in the cosmic waters. All identities are destroyed and Balaji floats on the endless cosmic waters for eons. How Venkateswara Came to be Known as Balaji? Today Balaji is no longer associated with the cosmic child. He is more closely associated with Lord Venkateswara of the Tirumala Hills. There is no reference to the name Balaji in any of the scriptures or inscriptions associated with the world famous Tirupati Venkateswara Temple. Earlier the term Balaji was mainly used by Hindi and Marathi speaking devotees of Venkateswara. Baji Rao III – the third of the Peshwas of the Maratha Empire – succeeded his father in 1740. Baji Rao extended the Maratha supremacy beyond Delhi into Punjab as far as Attock and Bihar, Bengal and Orissa. The Marathas under Baji Rao III controlled everything from Dwaraka to Jagannath and from Rameswaram to Multan. The complete name of Baji Rao III was Balaji Baji Rao. Santana Dharma flourished during the period and there was a great revival of hymns, biographies of saints, Vedanta, epics and puranas. Moropant abridged the Mahabharata, Ramayana and Bhagavad Purana during the period. Lord Vishnu is the protector, preserver and patron of life on earth. He brings stability and order. Thus he gives meaning and value to everything in the world. Vishnu Sahasranama is the thousand names of Vishnu – the Lord who institutes and maintains Dharma in the universe. Balaji Name is mentioned in the Vishnu Sahranama. It means the eternal child.